Acanthosis nigricans is a dark and velvety thickening of the skin in the armpits, neck and other body folds. It is considered as a marker for certain internal malignancies and endocrinal disturbances. Acanthosis nigricans may occur due to a hereditary predisposition or associated with many diseases and medications. People with acanthosis nigricans are known for their resistance to insulin in diabetics. The importance of acanthosis nigricans lies in the fact that at times it could be associated with certain cancers. Infact, sudden appearance of acanthosis nigricans at any age calls for a thorough investigation of body systems to rule out any underlying cancers. What is the Cause for Acanthosis Nigricans? As mentioned above, there are many causes for acanthosis nigricans. According to the underlying cause, acanthosis nigricans is divided into 5 different types. Hereditary Benign Acanthosis Nigricans. This type runs in families and there is usually no associated endocrine disorders. This type of acanthosis nigricans appears in childhood and increases at puberty though many regress with age. Benign Syndromic Acanthosis Nigricans. This is associated with certain endocrine diseases. Insulin resistance is an underlying pathology in benign acanthosis nigricans. Most patients will have any of the following hormonal problems: diabetes, increased androgen secreting tumors, acromegaly or gigantism, Cushing’s syndrome, Addison’s disease , hypothyroidism etc. Course depends upon the management of underlying disturbance. Pseudo Acanthosis Nigricans associated with Obesity. Starts at puberty. Common among dark skinned. Obesity—insulin resistance. Regression seen with significant weight loss. Malignant Acanthosis Nigricans. Associated with adenocarcinoma of GIT and GUT tracts, less commonly with lymphomas. Even as early as 5 years of onset of other signs and symptoms of certain malignancies. Usually regress after successful treatment. The typical skin features of thickening and dark pigmentations in acanthosis nigricans are caused by certain chemicals secreted by the tumors or the effect of hormones, including insulin on the skin fibroblasts and melanocytes. How Can Acanthosis Nigricans be Diagnosed? Acanthosis nigricans has to be differentiated from diseases like Confluent and Reticulated papillomatosis, pigmented pityriasis versicolor, X-linked Icthyosis, retention hyperkeratosis and excessive nicotinic acid ingestion. Diagnosis of acanthosis nigricans is mainly from the history and clinical presentations. A complete workout including a hormonal profile, blood sugar, biopsy of the skin and histopathological study, and, in case of suspected malignant acanthosis nigricans, a full body imaging and endoscopy is called for. Irrespective of the cause, all varieties of acanthosis nigricans show a dark pigmentation and thickening of the skin, usually in a symmetrical manner, on the neck, axillae, groins, elbows, behind the knees, around umbilicus and in the perianal region. 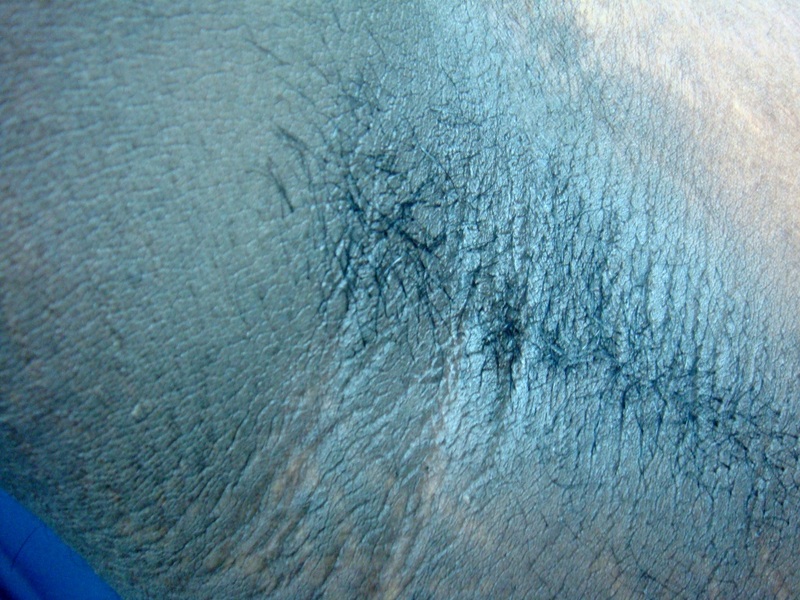 Skin looks dirty and the surface is wavy and rugose with a velvety appearance. Skin lines show up prominently. In acanthosis associated with obesity, the dark, thickened and velvety patches are more pronounced on the apposed surfaces of the folds, especially the thighs. Skin tags appear in large numbers in these patients. In the severe malignant variety, all features of acanthosis nigricans are accentuated: the skin is more thickened, dark and velvety and there is often involvement of the palms, soles, oral cavity and the edges of the lips. How to Differentiate Malignant from Benign Acanthosis Nigricans? How to Manage Acanthosis Nigricans? Do you mind if I quote a few of your articles as long as I provide credit and sources back to your weblog? My blog is in the exact same area of interest as yours and my visitors would genuinely benefit from a lot of the information you provide here. Please let me know if this okay with you. Thank you! Thanks for the feedback. You may quote my articles with proper credit and source reference. Kindly send the link when you do so.